The classic Gideon Bible…but hey, it looks hip for those college folk. The ring of the doorbell. The two people standing outside the university commons with boxes of little books beside their feet. The white-shirt and black-tie-clad men walking down the street, official name tags bouncing a rectangle of sunlight off their chests. Maybe you despise these people with a fiery passion. Maybe you accept their words and gifts with open arms. 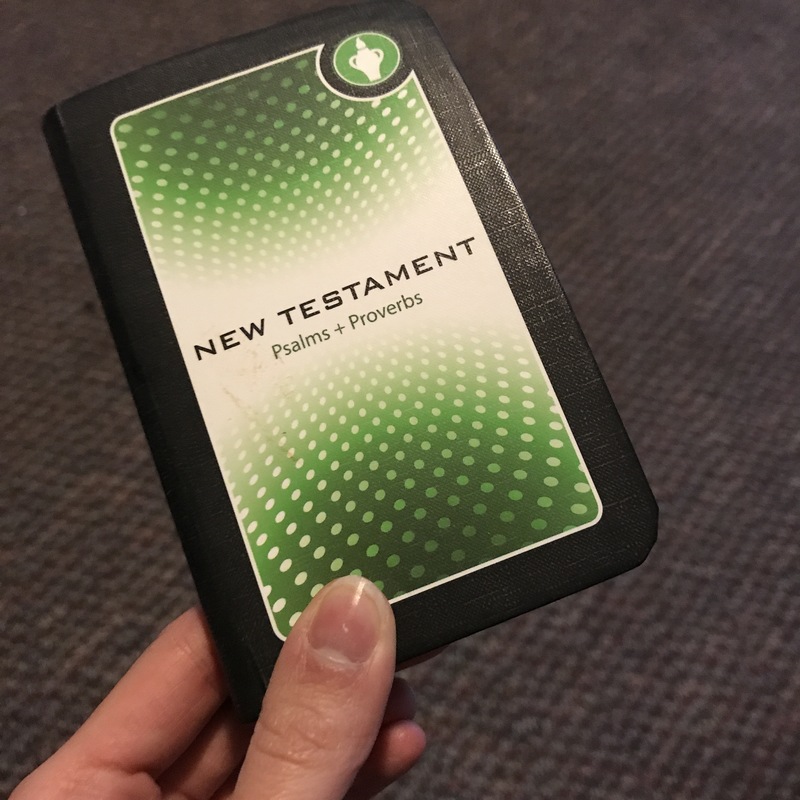 Whichever opinion you hold, we’ve all been in the presence of Christian missionaries who volunteer to hand out Gideon Bibles and talk about their faith. You don’t even have to be an official church goer to express your faith to others. That’s everyday evangelism, but those conversations in an everyday setting get a bad rap. And I’m included with those who often cringe at open dialogue about Jesus despite my own spiritual passion. I cannot handle those who shove beliefs down others’ throats who aren’t interested and didn’t ask for it. I don’t appreciate turning public forums like schools into makeshift churches. That’s not their purpose. Christianity is too often defined by those outspoken few who either take advantage of diverse settings or use faith as an excuse for hatred and violence. Yes, those two extremes seem like polar opposites, but they each leave us questioning the intentions and integrity of the church. The entire premise of using faith seems backward from how we should view faith and how to draw more people to it. The word “evangelism,” regardless of its original definition, now leaves a sour taste in my mouth, associating the pushy door-knockers and rioting people outside abortion clinics with what is simply sharing ideas. That’s where the word started, but our human desires have manipulated its meaning to fit our own criteria. Another problem I have is Christianity’s relationship to other religions. While I don’t think it’s an isolated belief, but when you identify with a certain faith, that doctrine becomes the only way. No other religions will fulfill that same purpose as yours does. If others don’t believe the same as you do, they automatically are at risk once they’re time on earth is up. Sharing our spiritual beliefs should not fuel the “us vs. them” mentality. We have enough of that already. We should not feel pressured or guilted to believe a certain way over another. We should not feel judged if we politely decline a free Bible or Book of Mormon. I am of the personal mentality that somehow, all religions are “correct” if followed with the best intentions. I mean, all of all beliefs stem back to very similar origins. The stories that make up our holy texts came from those of even more ancient religions. Look up Zoroastrianism, and you might be surprised by what ideas our ancestors believed and how they seem to resonate in religion today. I think we all are drawn to beliefs for a reason. It’s not pure accident that we feel more at peace with some ideas over others, and even then, we like to tailor basic doctrine to fit our own worldviews. Some people might have more intricate and complex ideas than others, but ultimately, I think we all end up in the same place. So the real challenge here is how to coexist and love one another despite our apparent differences. It’s in our personal insecurities that we use religion as a defensive weapon to assert beliefs over “wrong ones.” That’s where we see terrorism in the name of a religion that would never condone such violence. That’s where people stand on streets with signs condemning all people who are not white, straight and American. How can we change the conversation then? Recent events make that task even more difficult. People now identify as spiritual and not religious to avoid the strict mentalities of church. Many of my friends are agnostic or atheist that are quick to peg down God and religion as illogical, manmade conceptions to divide ourselves and deny academic discoveries. Even though I along with many other religious people believe in evolution and science. Ultimately, the most important thing is that we, in our own ways, connect to spirituality, and that we can engage in open dialogue that encourages new ideas and welcomes anybody to the table. If someone is meant to join a certain labeled doctrine, then they will find their path there; you cannot force it in their face and expect results. We need more understanding, more compassion, more silence allowing us to truly listen to others. Isn’t that what religion teaches us? To cherish universal morals and values, to connect with others regardless of their denomination? We’re all in the same boat. We’re organisms living on the same planet in the same moment in time simply going about our brief existences however we see best fits. Let us use our time and energy to share love. That doesn’t mean we have to gather around a bonfire to sing songs and hold hands. At least not without hand sanitizer. But since faith (or lack thereof) is simultaneously a touchy subject that largely impacts our perspectives, we need to learn how to approach it and how to accept others regardless of their relationship with faith. We’re all in different stages and places, and that’s okay. When simply communicating with others outside a public, professional sphere, we should explore how religion could make its way in discussion. It’s how we can learn more, become more welcoming than defensive. Posted in Speaking SpiritualTagged christianity, conversation, dialogue, diversity, evangelism, faith, growth, history, humanity, learning, opportunity, religion, society, spirituality, understandingcomment2 Comments on Free Bibles! Well said! God does a better job at setting up these moments than we do forcing them. I just share the message and let God work in hearts.